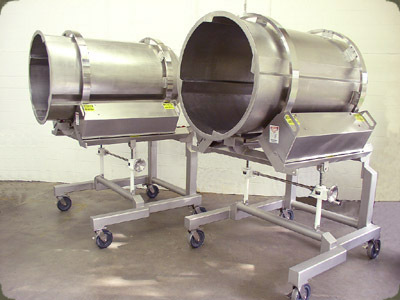 TUMBLING DRUMS provide proven design solutions for a variety of material coating, flavoring and sizing jobs. These Drums are available with a variety of flighting options and retention time can be controlled with the tilting frame and varing speed. 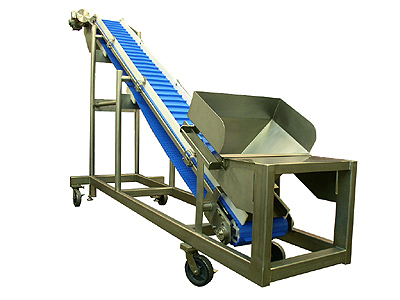 VIBRATORY CONVEYORS provide conveying, screening, and distribution to meet specific application needs. 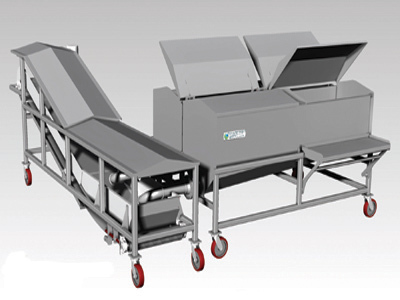 Tumbling Drums and Vibratory Conveyors are available in agricultural grade through food and sanitary style construction. 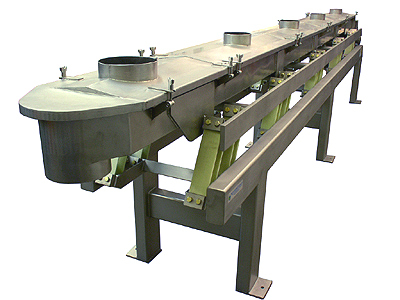 BELT CONVEYORS are available in a wide selection of styles and materials. Custom fits are our speciality to help you solve your application. Materials range from all Stainless Steel construction for sanitary applications to agricultural and chemical duty with special coatings as needed. 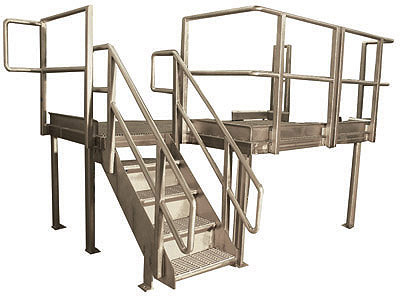 PLATFORMS AND CATWALKS are additional items that we can supply to finish your equipment project with safe access for maintenance or cleaning. Quality construction and various material types available based on your needs. 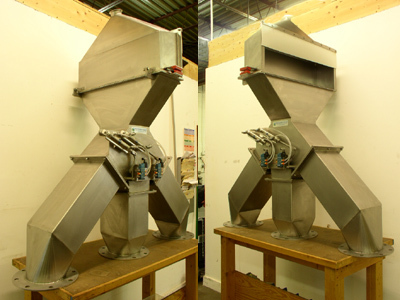 BLENDING / DEWATERING Blending Hopper for Frozen Vegetables with spray wash to expedite the thawing process. Product flows onto dewatering conveyor and continues to processing. Water drains and is directed to outlet in catchpan. DIVERTER VALVES are offered in a variety of configurations and materials of construction. Actuation can be accomplished by manual operation or pneumatically automated by customers PLC. If there are any questions, please feel free to ask using the information on our Contact Us page.